Therese Brady, was director of bereavement services at the Irish Hospice Foundation. 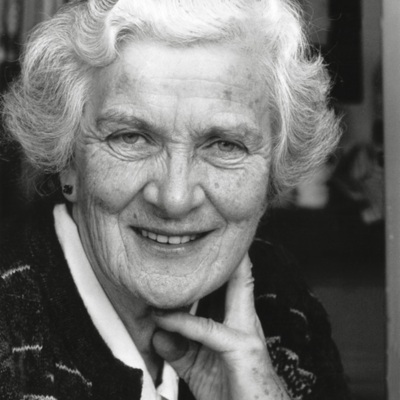 She was director of the Masters Programme in Clinical Psychology at University College, Dublin. She worked in the area of bereavement education and research and developed the Professional certificate in children and loss and the Irish Hospice Foundation's workshops programme. .She developed the volunteer training for bereavement support at Our Lady's Hospice Harolds Cross and published extensively in the area of bereavement and loss. 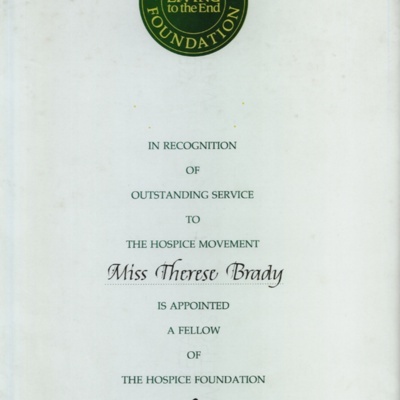 The late Thérèse Brady 1930-1999 who developed the Irish Hospice Foundation Bereavement Services in the late 1980s. An obituary for Thérèse Brady published in Medicine Weekly. 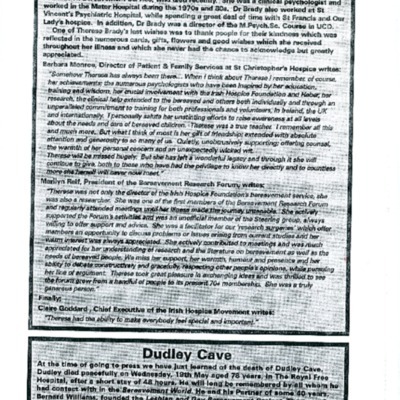 An obituary for Thérèse Brady that appeared in Medicine Weekly following her death in 1999. IHF Founder Mary Redmond's tribute to Thérèse Brady at her funeral on 1 February 1999. 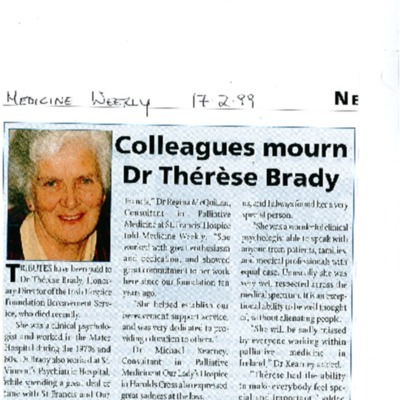 An Obituary for Thérèse Brady, clinical psychologist, honorary director of the IHF Bereavement Service.. (1930-1999) published in Lifeline. 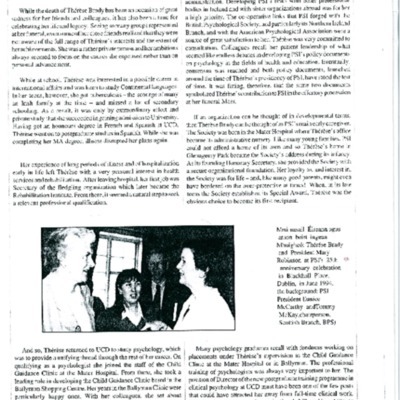 An obituary for Thérèse Brady - clinical psychologist and honorary director of the IHF Bereavement Service - published in The Irish Psychologist in May 1999. 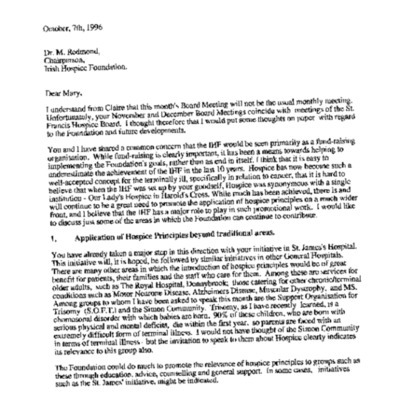 A letter from Thérèse Brady to IHF founder Dr Mary Redmond setting our her vision for the organisation. 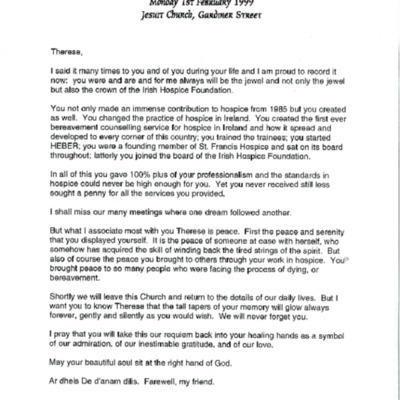 A typed letter from Thérèse Brady to Dr Mary Redmond. It was written in October 1996. It sets down Thérèse Brady's ideas for the IHF.